Hello all, I have officially returned! Please note: New Updates (v0.0.9 and Above) are NOT compatible with previous versions. I've rebuilt the mod from the ground up, with less bugs and more fun. I hope you all do enjoy some of the changes I've made, and sorry for that like, half year almost hiatus! Out of the corner of your eye, you notice... blue? A bright, vibrant blue leaf comes gently floating in your direction. Curious, you decide that that break you took wasn't that important, and begin walking in the direction that the leaf came from. A new dimension, The Crystallia; a once peaceful world turned hostile, despite the light that shines. The dimension itself is accessible, but is heavily under work. The current dimension will soon be changed drastically, as it's only a placeholder. Changed the way some flowers spawn in worlds. Added Saplings! They have a 5% chance to drop when you break a leaf from a Crystallian Tree. Saplings currently have no use, but will in the near future. Mushrooms have invaded the Luminous Acres. Another hellish dimension, The Umbris. More items you can make through the altar. Images of the items, as well as the current biomes can be found under the images tab. Mine the Crystalli, I hope you have a diamond pickaxe or a pick of the same harvest level (aka one that can mine obsidian). You also will need a few diamonds to make your first set of armor and tools. And that's all for now. I really do hope I did alright for my first mod. I will do my best to fix any problems and balance the mod, but for now, it is what it is. Love this mod so much ofc, as I've said <3 I wanted to make some suggestions! - Decrease biome spawn rate. I'm using BoP and even with all of the different possible biomes, I would estimate the biomes from your mod make up as much as 25% of all biomes. - Trees counting as, er, trees? This may go along with making saplings work, but for example, the TreeChopper mod does not work with the trees in this mod and the leaves don't seem to naturally decay either. - Guide for Fusion Crafting. I read that you can currently make Evencrystium, but I am unsure how haha. - Not sure if this is intentional, but Crystalli Creepers spawn pretty frequently in the End. 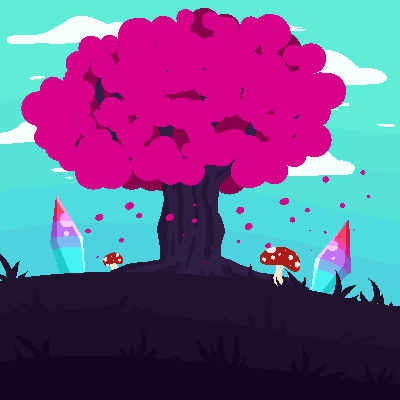 - Add a use for the mushrooms (if there is one, idk what it is). Being able to turn them into dyes would be cool! - If minerals above Crystalli are supposed to be rare, I'd recommend decreasing the spawn rate. I've been able to craft full sets of armor of Midnite and Eventidium almost as easily as Crystalli due to the spawn rates. I'm really looking forward to the dimensions being implemented! The Crystal Desert sounds amazing and I'm excited for boss mobs, too. <3 This is honestly one of my favourite mods bc it's so pretty and it's pretty well done. And I didn't realize Crystalli Creepers spawned in the end... that's a pretty strange bug to say the least, I'll have that fixed in later updates! Mushrooms will be getting a use too, and I have some [probably] good news that leaves on the many different trees will soon decay, just like all others do! These updates will be coming soon, but I am first focusing on getting leaf decay working at 100%! For now I suggest using veinminer as it works like a charm with most modded blocks! You may have to add some things via the config but it functions mainly the same as treecapitator or treechopper, the leaves and wood will just have to be broken separately. I remember using this a few months ago and being really hopeful about its future. Can't wait to try it now that you've rebuilt it! Thank you! I hope you do like what I've done with it since way back when, I'll admit it was pretty buggy and felt very incomplete then ^^; but it should look and work much better now! Thanks!! Saplings are my next project for this mod, just have to makes some new smaller tree schematics for them! I'd love to have it so the big ole trees spawn in when ya plant a sapling, though with some of them (like the crystalli or umbral, even luminous) I feel smaller variations of the trees would be much nicer and player friendly to have for say farms and stuff. You have a species on DA?! Me too! Small world xD Is your species called Gem Beasts as well or? I tried searching for Gem Beasts, but a lot of results came up, so I wasn't sure which is yours ^^; Is your username sporadicsplash? Ahh Wishfuls look so cute uwu I really like the virtual pet idea too, I don't think many species do that kind of thing!! Unfortunately doesn't work with later versions of Forge. Thank you for letting me know! Which version of forge is it working with? I'm putting out an update today, so before that I'd like to test some things out with Forge beforehand now! If I remember it's the 'recommended' versioin of Forge. However many mods work with the latest versions, causing incompatibilities with your mod. Mcreator updated, should fix this. It updated? Could you give me a link to 1.8.4 because on the website it says the latest is 1.8.3, which I've been using ^^; Thanks for letting me know bout the forge thing though, I'll have a ticket submitted about the ordeal and hope it's just a bug that'll get fixed in the next launcher update!